What is the TBILLPRICE Function? The TBILLPRICE function is categorized under FINANCIAL functionsFunctionsList of the most important Excel functions for financial analysts. This cheat sheet covers 100s of functions that are critical to know as an Excel analyst. The function will calculate the fair market value of a Treasury bill / bond. In financial analysis, TBILLPRICE can be useful in determining the value of a bondBond PricingBond pricing is the science of calculating a bond's issue price based on the coupon, par value, yield and term to maturity. Bond pricing allows investors and deciding if an investment should be made or not. It helps calculate the FMV of a Treasury bill when we are given the settlement, maturity and discount rate information. Settlement (required argument) – It is the settlement date of the T-bill. The security settlement date is the date after the issue date when the T-bill is traded to the buyer. Maturity (required argument) – It is the T-bill’s maturity date. The maturity date is the date when the T-bill expires. Discount (required argument) – It is the T-bill’s discount rate. 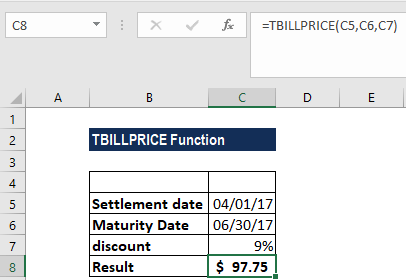 How to use the TBILLPRICE Function in Excel? The function returned a value of $97.75, i.e., a Treasury bill with the above terms would be valued at $97.75 (rounded to two decimal points). The supplied discount argument is less than or equal to 0. The settlement or the maturity arguments are not valid dates. 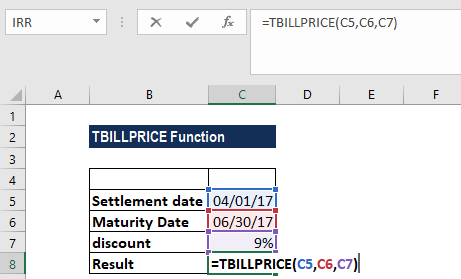 Dates returned from other functions or formulas.